QUITO, Ecuador, July 31, 2018 (ENS) – In a benchmark pollution case, Ecuador’s Constitutional Court has rejected Chevron’s final appeal of a $9.5 billion pollution judgment that found the company deliberately dumped billions of gallons of toxic oil waste onto Indigenous lands in the Amazon rainforest. The unanimous 8-0 decision, issued in a 151-page document published July 11, was a total victory for the Indigenous groups that brought the case and a rejection of all of Chevron’s claims. The Court rejected Chevron’s allegations that it was victimized by fraud, and the court threw out the company’s claim that Ecuadorian courts had no jurisdiction over the matter. The decision also raises the total number of appellate judges in Ecuador and Canada who have ruled against Chevron on either the underlying merits of the case or its fraud claims to 29. Ecuador’s Constitutional Court, which deals only with Constitutional issues, is the third major appellate court in Ecuador and the fourth court overall in the country to uphold the trial-level decision against Chevron, which was issued in 2011. Ecuador’s highest civil court, the National Court of Justice, has ruled unanimously to affirm the judgment against Chevron. The class action case against Chevron was spearheaded by the Frente de Defensa de la Amazonia, the Amazon Defense Front, a grassroots group representing 80 Indigenous peoples and farmer communities in Ecuador’s northern Amazon region. The case was originally filed in 1993 in federal court in New York against the former oil field operator Texaco, now part of Chevron Corporation, on behalf of an estimated 30,000 rainforest villagers. But in 2001 a U.S. federal judge moved it to Ecuador’s courts at Chevron’s request after the company accepted jurisdiction there. “This decision is another huge victory for the people of Ecuador in their historic two-decade battle for environmental justice against the world’s worst corporate polluter and rogue operator,” said Luis Yanza, a Goldman Prize winner who initiated the lawsuit against Chevron in U.S. federal court in 1993, and serves as president of the Frente de Defensa de la Amazonia, Amazon Defense Front. “No country should ever do business with Chevron until the company first pays for the harm it caused to the people of Ecuador,” Yanza said. 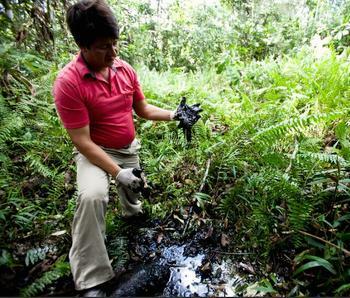 After eight years of proceedings slowed by Chevron’s strategy of deliberate delay, Ecuador’s trial court relied on 105 technical evidentiary reports to find in 2011 that the company poisoned a 1,500 square mile area of the Amazon with carcinogenic oil waste. Thousands who live in the rainforest, including many Indigenous peoples, have died of cancer while tens of thousands must endure what is one of the world’s worst ongoing public health catastrophes. Ecuador’s government, which received royalties from Chevron’s operation of 400 well sites, has been of little help to the victims. Medical care in the affected region is non-existent, and many people perish from cancer without even visiting a doctor and after receiving no treatment, said Steven Donziger, the Harvard educated U.S. legal representative of the Ecuadorian communities, who has taken dozens of trips to the affected area. 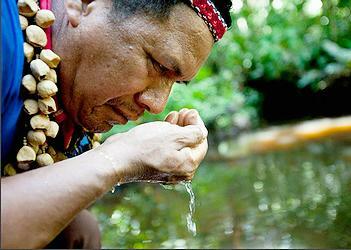 Chevron has refused for years to pay the Ecuador judgment, now worth $12 billion with interest. Company officials have threatened the Indigenous groups with a “lifetime of litigation” if they persist. The latest Ecuadorean court decision is also a major blow to controversial Judge Lewis A. Kaplan, a judge of the U.S. District Court for the Southern District of New York. In 2014, Judge Kaplan ruled that the $9.5 billion Lago Agrio judgment leveled against Chevron by Ecuador’s highest court, was obtained by way of fraud and coercion. Kaplan relied on false testimony from an admittedly corrupt Chevron witness to find that the Ecuador judgment was procured by fraud. Kaplan refused to seat a jury of impartial fact finders, and he refused to consider any evidence of Chevron’s environmental contamination in Ecuador. But Kaplan’s decision was disproven after evidence emerged that Chevron paid large sums to Alberto Guerra, a former Ecuadorian judge booted from the bench after he admitted taking bribes. Guerra was moved with his family by Chevron to the United States and later admitted lying on the stand after being coached for 53 days by Chevron lawyers headed by Randy Mastro at Gibson Dunn. Kaplan based his core findings largely on Guerra’s false testimony. And Kaplan remains the only judge in the world to have ruled in favor of Chevron. Seventeen Ecuador judges, who had access to a fuller evidentiary record than Kaplan, ruled in favor of the affected communities. Twelve judges from Canada, including the country’s entire Supreme Court, have also ruled in favor of the Ecuadorians on various technical issues. Ecuador’s Constitutional Court rejected the same fraud claims that Judge Kaplan accepted. It also turned away a handful of Chevron objections regarding jurisdiction and applicable law that the company has been recycling in various forums for over a decade in an effort to delay a final resolution, said Donziger, who has been representing the plaintiff Indigenous people. 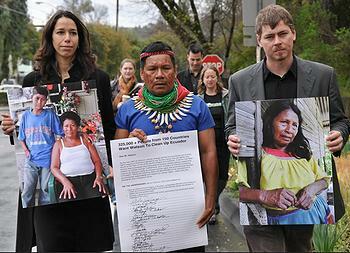 The Ecuador decision confronts Chevron on the brutal human consequences of both its original environmental crimes, which the Court emphasizes were not the result of an accident, but rather of deliberate operational decision-making designed to save money and enrich the company’s shareholders and executives, and the additional offense of its two-decade campaign of distraction and delay. The Court held that contracts and legal doctrine should not be construed to give a private entity a right to pollute where environmental and human rights of third-parties were impacted. The Ecuadorian plaintiffs also have picked up several appellate victories in Canadian courts as they attempt to collect Chevron assets in that country to force compliance with the Ecuador judgment. But Donziger is also losing due to his involvement in this case. On July 18, a New York state appellate court took the unusual step of suspending Donziger’s law license without a hearing, leading to “shock” among lawyers who have followed his long-running battle with Chevron and the law firm Gibson Dunn & Crutcher over the clean-up of the oil major’s massive pollution in Ecuador’s Amazon. Short-circuiting the legal process to deny Donziger a hearing, staff attorneys at the state bar grievance committee, which regulates attorney conduct, characterized him as an “immediate threat to the public order” even though he has not received one client complaint in 25 years of legal practice and has won numerous honors and testimonials for his public service work. In comments last week, other attorneys and activists, including esteemed First Amendment lawyer Martin Garbus, Harvard Law Professor Charles Nesson, human rights lawyer Aaron Page, and Greenpeace Co-founder Rex Weyler, said they were “shocked” by the New York Bar’s decision to suspend Donziger. 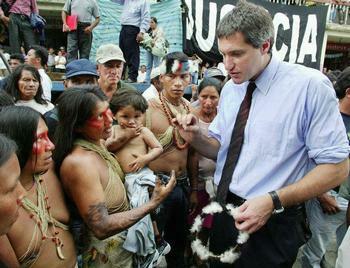 “Even worse, I know from personal experience and from studying the case closely that there is ample evidence to prove Judge Kaplan’s findings are either false, based on witness testimony paid for by Chevron, or the result of a completely decontextualized reading by Judge Kaplan of foreign law in Ecuador,” said Friedman, who noted that Kaplan also refused to consider any of the environmental evidence against Chevron relied on by the Ecuadorian courts for their decisions against the company. Rex Weyler, a co-founder of Greenpeace and friend of Donziger, called Donziger a “hero” for standing up to Chevron. “This is always the way the status quo power structure protects its own,” said Weyler. “The more frightened they are by the truth, the greater their lies. They did this to anti-slavery activists centuries ago, to the suffragettes, to Ghandi and Martin Luther King, and to Indigenous leaders throughout the world. “This shameless pandering by the New York judiciary to power and money will be exposed in time,” said Weyler. In Ecuador, several leaders of the rainforest communities have sent letters of support to Donziger, who remains a member of the District of Columbia bar and who plans to appeal the New York decision to suspend his law license.